Sitting in the hotel room in Charlottetown on Wednesday night, I knew where I'd be heading the following day only so far as the junction of Highways 2 and 16 in New Brunswick. The initially formulated plan entailed driving down along the shore of the Bay of Fundy toward Yarmouth. But that would mean a lot more driving than I cared to do. I considered heading into New Brunswick, but Moncton didn't seem an appealing destination. As I debated between these two less than stellar options, a third entered my head... why not just go straight back to Halifax? I didn't see quite as much of the city as I'd wanted during the first go-around, so having some of Thursday and all of Friday would help in making up for that. Easier said than done. That middle weekend of September encompassed both the start of the Atlantic Film Festival and Cutlass Fury, a large anti-submarine warfare exercise off the coast. I had a room at the Four Points for Friday night, but extending that reservation back a day? No can do, nor were there any rooms available anywhere else in Halifax or Dartmouth. I was wondering whether I'd end up out in Truro, about sixty miles to the north. Fortunately, I didn't need to settle that far out; the Quality Inn near the airport had a room, which I jumped at. After getting a bit of a late start out of Charlottetown, it was about an hour to the Confederation Bridge, the fixed link connecting Prince Edward Island to the mainland. I spent about an hour at Gateway Village, the shopping complex on the PEI side just prior to the toll booths. Besides watching a video on the Bridge's construction, I grabbed a T-shirt and lunch - and also dessert, since Cows had a shop in the centre. After that, it was over the bridge for a quick stop in New Brunswick so I could claim that I've been to the province, taking my total to seven plus the Yukon. I took the TCH back down - initially to Dartmouth, so that I could snap some pictures of Halifax from across the harbour. 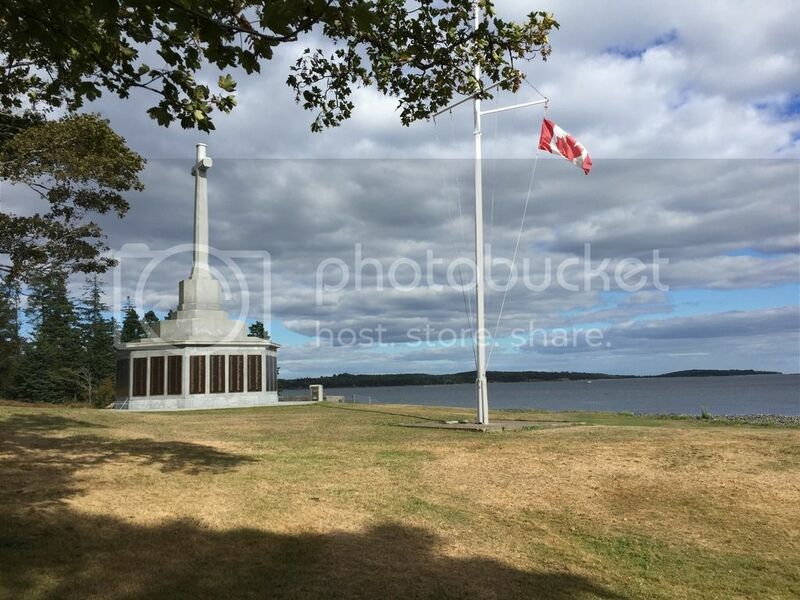 I rolled the Volvo down to the southern tip of the city, to Point Pleasant Park, where I watched a cruise ship depart, paid respects to my brethren north of the border, and just generally relaxed and reflected. I had dinner at HFX Sports, which had one of the more insane setups of screens that I've ever seen in my lifetime. The server mentioned specials on both beer and wings. I happily took the latter, but the beer on offer was Budweiser, I believe. I politely demurred, as opposed to laying down my true opinion: "I don't drink that swill in my own country, so I'm certainly not going to drink it in yours" - notwithstanding the fact that I imbibed the Canadian equivalent six nights earlier. I drove out of downtown to check into my room, wondering whether I'd want to make a trip back in afterward. That was rendered unnecessary by the existence of a bar in the Quality Inn. After Jeopardy!, of course, I headed down for a drink or several. Nothing of note occurred until I was noticed tapping on my phone by the couple seated next to me, after which a conversation was struck up. It turns out they live in New Jersey - and in the good half to boot (that is, the northern half, populated primarily by Giants and Jets fans vice Eagles supporters). 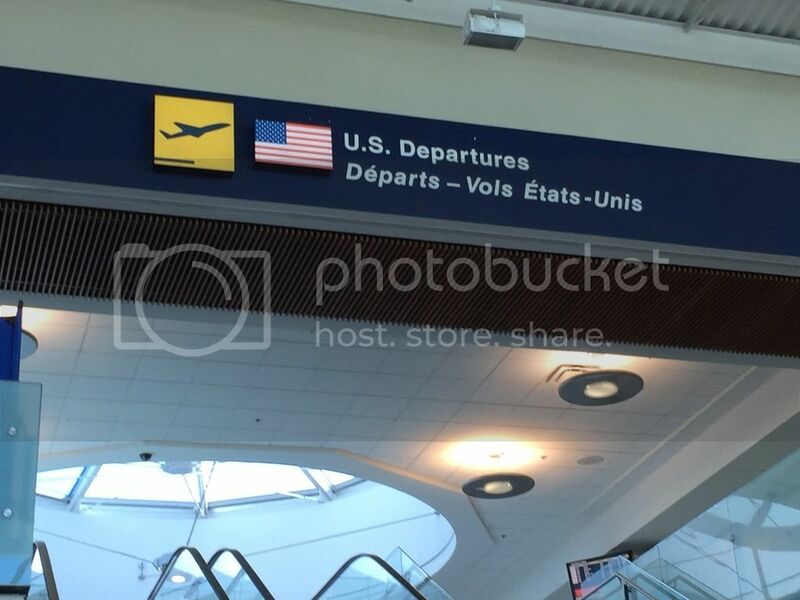 He was in Nova Scotia on business, and had also booked there the night before, encountering the same difficulties in finding accommodation as I had. He was originally from Jamaica, and she from Ireland; this took the conversation in a nice direction, as my family is mainly of Irish extraction on both sides (my mother's maiden name is Monahan). I stated my last name, and I think she mentioned what part of the Emerald Isle that corresponded to. That being said, I'm not sure I could recall it the next morning - I certainly am unable to nearly six months later! The ethanol - in my case, Alexander Keith's IPA - kept the conversation flowing nicely for over an hour, after which I retired to my room to catch the end of the Bills and Jets. Before checking out the following morning, I watched Jeopardy! again, that day's game having been bumped to mid-morning by WBZ's airing of a Patriots "all access" show. (More on that experience in a "mop-up" post to follow.) I spent the early part of Friday afternoon lazily walking up and down the waterfront. Given the intervening events, I now regret not having visited the Canadian Museum of Immigration at Pier 21. 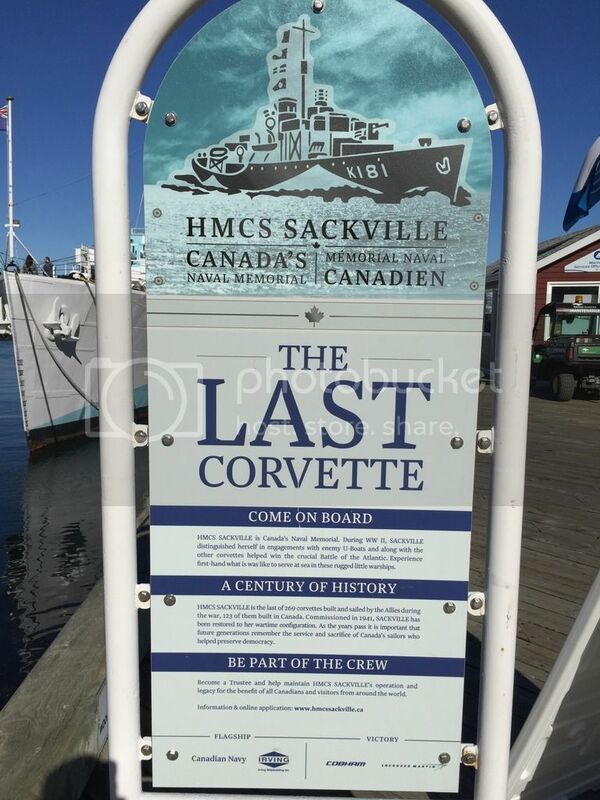 What I don't regret was spending the five dollars to tour HMCS Sackville, Canada's Naval Memorial, a World War II-era corvette restored to its 1940's configuration. Just as I thought it necessary to visit USS Pampanito when I was in San Francisco many years ago, I felt it right and proper to take a step back in time and pay respect to the brave Canadians who gave their lives in defence of freedom (and did so for much longer than the United States was involved in those wars). Shortly after I boarded, I and another American couple were offered to be toured around the ship by a gentleman who'd himself served in the Royal Canadian Navy decades ago, which added wonderful additional context. Among Sackville's missions was locating and taking out submarines; at the mention of this, I could not help but disclose the particular branch of my Naval service. I had not planned to eat anything in the middle of that Friday afternoon, but that plan was upended when I noticed a passerby eating from a paper bowl - and particularly a logo on said bowl. What's that, you say? Cows has a retail operation on the Halifax waterfront? You know what that means - that's right, YET MOAR ICE CREAM! Even so, when it came time for dinner, I had more than enough space for both it and the attendant drinks. The aforementioned Alexander Keith's wanted to charge me twenty-six Canadian dollars to look around their brewery. Having toured the facilities of both Samuel Adams and Harpoon in Boston nearly a decade ago, I saw no need to spend that money. But the Red Stag offering many of their brews basically right from the source plus food, within easy walking distance of the Four Points? Sign me up. During this last dinner in Canada, I made it a point to fill my glass with a different beer each time; they all complemented my burger and fries quite nicely. Back in the room, I noticed my wallet was utterly devoid of paper and metal currency. I resolved to withdraw sixty dollars, and whatever I didn't spend on drinks that night, less a dollar to get back to the airport and a few coins as souvenirs, would be donated to a homeless person. After briefly contemplating how to play Argyle Street on this final night of the trip, I ultimately decided to follow Lefler's 36th Law - "you gotta go with what works," and so it was back to Durty Nelly's. It was once again a great time, and I left with a smile on my face and sorrow at what was to come the next day. First and foremost, what was to come the next day was a bleep-ton of alarms, on par with those I set to awaken myself for a day shift of work. Thankfully, I only needed the first of them. I had set myself up to pack quickly, but a quandary presented itself after I checked out of the Four Points... where's the nearest homeless person? I had trouble finding one, wondering if the constabulary had swept the city clear ahead of the film festival. That ended up not being so; I did find such a disadvantaged person, and did give him a couple of bucks. The transit to the airport was without incident, in contrast to my transit through CATSA's checkpoint; as it was on my way into Canada, my laptop was checked on my way out of it. Once I'd cleared that and pre-cleared United States Customs, I set my sights on lunch in the airport terminal. I'd wanted it to be Tim Hortons to provide a proper bookend to the trip; but they were closed, so I made my way across the waiting area, where I had one last burger and a couple more Keith's IPAs. They were most necessary, because Flight 4089 sat for an hour on the tarmac at YHZ due to an extended "issue with the company," which led us to have to return to the gate to take on additional fuel. But eventually the plane took off, and the flight was trouble-free. Two items of note from the drive home from PHL. For one, I had not changed the units of my GPS back to miles, so I drove down Interstate 95 and up Interstate 476 trying to reconcile the speed limit signs against what the GPS was showing me. And for two, after a week of driving a car that slowed down when it sensed a vehicle in front of it, I had to remind myself, "the Compass DOES NOT have adaptive cruise control!" All in all, those last three days were just as good as the five before them - a heck of a capstone to a heck of a trip. They do, however, leave me with one big question. I plan on taking off from work the last week of June... so which part of the country will I visit to celebrate Canada 150?